Earth Connection » Act now to save our beloved Earth! Everyone who knows me understands that I am passionate about climate change. I truly believe it is the greatest crisis humanity has ever faced. And we must deal with it for the sake of all we hold dear–our children and grandchildren, all the other species with whom we share our earth, even for the sake of civilization itself. This month’s posting is different from what I normally post, in that I am asking for your help. In a few days I will dunk myself in the Mediterranean Sea at Tel Aviv, Israel! And I will be doing so to raise needed funds for the Chesapeake Climate Action Network (CCAN). Every January, CCAN gathers dozens of crazy, committed climate activists at National Harbor, outside Washington, DC, for a plunge into the cold, cold Potomac River. All of the ‘plungers’ raise money for CCAN’s climate change-fighting work by inviting friends and family to sponsor their plunge with a donation to CCAN. I have participated in CCAN’s Polar Bear Plunge five times before and have been able to raise well over $10,000 to fund CCAN’s work throughout Virginia, Maryland, and Washington, DC. Then it occurred to me that I could still participate! I’ll just jump into a different body of water on a different continent! The CCAN staff is up for my participating at a distance, so I am planning to take my plunge into the–I hope–warmer waters of the Mediterranean. I can honestly think of no better way to address climate change than to raise money for CCAN. With Trump poised to undo the progress we’ve made on climate at the federal level, many climate activists believe we must redouble our efforts at the state and regional levels. I agree. And even for people who do not live in the mid-Atlantic region, a donation to CCAN makes sense. CCAN has helped expand renewable energy, has stood up to those who want to build fracked-gas pipelines, and has educated many, many people throughout the region. Besides, given the global nature of climate change, effective action anywhere benefits all of us everywhere. So. I earnestly invite you to sponsor my upcoming march into the Mediterranean! Please help make CCAN’s work even more effective. If you click on my fundraising page below, you can donate to CCAN, easily and quickly. For a great many of us, our dog or cat is a dear companion. How we care for our pet matters, for the animal’s well-being, of course, and also for the well-being of our planet. One way our pets impact the environment is through their waste–that’s right, poop. Our nation’s dogs and cats produce more than six million tons of it a year! And there are pathogens in these dogs’ and cats’ feces that are transmissible to humans and wildlife. Dog poop can contain E. coli, Salmonella, Giardia, roundworm, and more. But cat poop is much worse. It can contain a parasite called Toxoplasma gondii, a pathogen associated in humans with miscarriages, fatal food poisoning, encephalitis, and even schizophrenia, scientists say. Toxo is common in urban and suburban soils, where house cats use flowerbeds as litter boxes. Toxo is also very harmful to wildlife. In the 1990s, a mysterious die-off of sea otters off the California coast turned out to have been caused by toxoplasmosis. The parasite could have reached the otters through runoff from the land and also through the flushing of cat poop down the toilet. While sewage treatment kills many pathogens, it unfortunately does not reliably kill toxo. Scientists attribute about 16% of current sea otter deaths to toxo. Toxo has spread through the oceans and has been found in dolphins, walruses, beluga whales, and even polar bears. The health consequences to these animals is not known. Check online to learn what your local sewage utility wants you to do. Some utilities call for bagging the poop tightly in plastic and throwing it in the trash. Don’t bother to invest in biodegradable dog poop bags. Given the low-oxygen environment of the typical landfill, very little biodegradation can take place anyway. So save your money and use ordinary plastic bags instead. If your utility prefers that you flush dog poop down the toilet, you can scoop up the poop in a plastic bag, empty the contents into the toilet, then tie off the bag and dispose of it. If you have a small dog, you might consider buying flushable dog poop bags. These bags are not recommended for use with large dogs because their larger output may be toilet-clogging. If you’re willing to go to some trouble, you might follow the example of Sharon Slack of Vancouver, British Columbia, who composts her dog’s poop! She cut the bottom out of an old trash can and bored some holes in the sides. She then buried the can, to just below the rim, in an out of the way spot in her garden. With a small shovel, she adds each poop deposit to the can. Now and then she sprinkles in water and an over-the-counter enzyme product used in septic systems. When the compost is finished, she spreads it in her garden and starts another batch. Because of toxo, do not flush cat poop down the toilet. Instead, bag it tightly in plastic and put it in the garbage. Some kitty litters are more environmentally friendly than others. The Environmental Working Group (EWG) recommends avoiding clay-based silica, clumping, and sand litters. They are obtained through strip-mining, which is very harmful to land. You’ll see Christmas trees dying — their needles turned brown. 30 million dead trees — that’s what you’ll find! For the National Christmas Tree Association. Or perhaps fueled by eggnog with way too much rum. “Well, no,” is the answer that Rick has to give. There’s a sort of arborial tree-incarnation! “But there have been some creative ones out there,” he adds. Some trees get a new life that isn’t half bad. 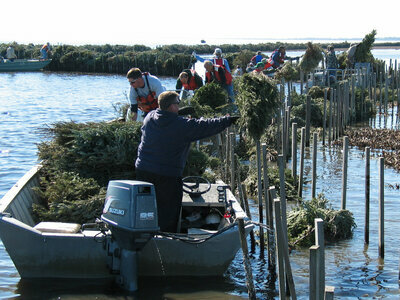 Near Jefferson, La., volunteers place recycled Christmas trees inside man-made wooden cribs in the shallow water of a local marsh in January 2011. The trees absorb wave action and protect fragile marshland from erosion. Down in Louisiana, where the land meets the ocean. Jason Smith uses trees to make coastal repairs. That applies to both Christmas trees and pachyderms. Rooting around for a new thing to eat. And they’re not alone, other animals try it. “Lions, tigers, the bears!” Oh my! It looks just like Christmas aboard Noah’s Ark. The fish population has recently slumped. Is that some of the streams are deplorably empty. There’s no habitat! So it’s time to branch out. “They need a calm place to rest and grow. Sink dead Christmas trees in their swift local streams. So they drummed up a posse of like-minded teens. And they’ll bring them all down to nearby Bradley Beach. Where they form the foundation of the town’s defense. And soon dunes will form — at least that’s the plan. It protects all the houses,” and habitat too. These trees might form forests in marshes and dunes. And dead groves will grow in the rivers and zoos. I’ve decided to make use of THE EARTH CONNECTION’s action thread to stir myself to take my own action, one I’ve been talking about for months. I’ve said to myself that I would like to be ready for such moments. There are relatively simple actions that everyone can take, and I’ve wished I had a small card I could hand to people, that lists three things any person can do. Knowing I wanted to post on THE EARTH CONNECTION’s action thread this week, I decided that now was the time to create this card I’ve been thinking about. So I wrote the text of the card and took it to a graphic designer/printer I know. Within days, I expect to have hundreds of attractively designed ‘business’ cards that I will keep with me in my wallet, ready to give out. YES! YOU CAN DO SOMETHING ABOUT THE CLIMATE CRISIS! 1. Educate yourself and others. Learn the science basics by reading Climate Change: Evidence, Impacts, and Choices. Free at http://www.nap.edu/catalog.php?record_id=14673. Share what you know with others, especially those who believe the lies the fossil fuels industry has been promoting–that global warming is not something we need to address. 2. Spread the word about The Healthy Climate and Family Security Act. This bill, now in Congress, would dramatically reduce greenhouse emissions and boost the income of most American families. Learn more at http://climateandprosperity.org/ Tell others about this promising bill. Urge your U.S. Representative and two Senators to sponsor it by calling them at 202-224-3121. 3. Join the movement to stop global warming. Many organizations are working effectively at local, regional, national, even international levels. Help build this growing movement by giving money, time, or spreading the word. One especially effective organization is http://www.350.org/. More than 200,000 people are expected to descend on New York City to show world leaders meeting at the UN that the public wants our leaders to take significant action to address the climate crisis. Now! If you’re not already planning to be in New York City on Sunday, September 21, for the largest and most diverse climate action to date, it’s not too late to make your plans. More than 1,000 organizations around the country are sponsoring the march, and groups in many cities are chartering buses to get people there. WHY NEW YORK AND WHY SEPTEMBER 21? In New York City, just two days after the People’s Climate March, United Nations Secretary General Ban Ki Moon will convene Climate Summit 2014. Moon conceived this summit in the hope that it will build momentum for the creation of a strong global agreement next year when leaders of the world’s 196 nations meet in Paris to try to hammer out a binding legal agreement to effectively address the climate crisis. Alarmed that most of the world’s governments are doing next to nothing about the climate crisis, Moon hopes that gathering world leaders in advance of next year’s United Nations Framework Convention on Climate Change will speed the process of coming to a meaningful global agreement. He has urged world leaders attending the New York summit to bring bold announcements of actions for reducing emissions, strengthening climate resilience, and mobilizing political will for action. That’s where we the people come in. The thousands upon thousands of concerned citizens converging on New York to support strong outcomes to Climate Summit 2014 will demonstrate that support for strong action from all the world’s governments is increasing rapidly. It is important that our numbers be large. The bigger the crowd, the more powerfully our message of urgency will be communicated. So please come! For more information about about the march, click here. To find a bus from your area, or information about housing in New York, click here. Many people understand the peril we face as a result of our warming world. But I find that many of these people feel helpless and believe there is nothing they can do to solve the problem. Fortunately, there is no cause for such helplessness. There is a great deal that all of us can do, that we must do if we want to leave our children and grandchildren a world where they can lead healthy lives. In a future posting, I will share some of what Al Gore just wrote in The Rolling Stone. He is optimistic that we can solve our climate crisis, and he persuaded me to be more hopeful as well. And today–or anytime this week–you can do something to help persuade Congress to take meaningful action to address climate change. Your action can be completed in a mere 10 minutes. Make three phone calls––one to your Member of Congress and one each to your two Senators. By calling this week, you will augment the efforts of thousands of climate activists from all over the country, who are in Washington right now, visiting the offices of all 100 Senators and all 435 Representatives. These citizen lobbyists are urging Congress to enact a tax on carbon that returns revenue to the public. It is very important that we all add our voices to those citizen lobbyists now gathered on Capitol Hill. After all, the fossil fuels industry has hired thousands of lobbyists to pressure Congress to act on behalf of their short term monetary gain at the expense of the public and the planet. Even though our democracy has been diminished in recent years as a result of gross increases of money in politics, our Members of Congress will do what the people want if they think hanging onto their seat may be at stake. That’s why we must make sure they hear from large numbers of us. So please call 202-224-3121, the Capitol switchboard. Ask to be connected to the office of Senator X or Congressman Y. Once you reach the office you requested, you can leave your message on a tape or ask to speak to the aide who deals with climate issues. I try to choose the latter option to increase my chances of speaking with an actual person. If, in fact, you do leave a message on a machine, be sure to include your name and phone number. This will assure office staffer that you are, in fact, a constituent. And feel free to express your passion; you don’t need to be an expert. After all, you wield the vote. May is Garden for Wildlife Month. If you enjoy watching birds and other animals, this may be the time to think about creating some habitat for them right where you live. And if you provide the four elements wildlife need to thrive–food, water, cover, and a place to raise their young, you can qualify for a Certified Wildlife Habitat designation by the National Wildlife Federation (NWF). In 1973, NWF created its Garden for Wildlife program. Gardening with birds and other native animals in mind makes a real contribution to the health of many species, especially since we humans have destroyed so much habitat by expanding our cities, shopping strips, and roads, etc., into the areas where so much wildlife lives. Pretty much anywhere you live, whether in a suburban neighborhood, a rural area, or even in the heart of a city, you can probably provide the four elements wildlife need to thrive and raise their young. In reading about NWF’s Certified Wildlife Habitat program (CWHP), I was surprised and delighted to learn that even someone who lives in an urban apartment, with only a balcony for outdoor space, can create a high quality wildlife habitat that qualifies for certification! NWF’s Wildlife Habitat program manager describes several tiny, urban apartment habitats that NWF has certified. In Suffolk, Massachusetts, for example, a couple strung their 25-square foot balcony with four hanging bird feeders that attract pine siskins, cardinals, redpolls, blue jays, and a half-dozen other species. The couple also put out oriole and hummingbird feeders. And containers of columbine, red-tooth dogwood, and other well-chosen plants provide cover for the birds. I find it so heartening that even when a tiny space is equipped with the things wildlife need, they will find and use that space, wherever it is. If you have more outdoor space available, like a back yard, you have more options for creating habitat. And the National Wildlife Federation has dozens of suggestions for what to plant, ways to provide needed cover, and so much more. If you get your wildlife habitat certified, you can display your certification sign proudly. Perhaps you will inspire neighbors and passers-by to establish their own wildlife habitat. Once you get started, you can sit back and enjoy watching the wildlife you attract! You are currently browsing the archives for the Act now to save our beloved Earth! category.